If you’re not sure when to visit Tokyo, then you may want to consider going in November as it is absolutely beautiful. It’s a turning point in the autumn season when the trees are stunning shades of orange, yellow, and red. The weather has a slight chill, making it the perfect temperature for outdoor activities. During this month, tourist season has died down just enough to make exploring Tokyo a little easier. If you’re thinking of visiting in November, it’s definitely recommended. Here’s everything you need to know. Many people consider the weather in Tokyo to be perfect during November. Unlike summertime, there’s no heat waves or horrible bouts of rain. It feels crisp, slightly chilly, but without any of the cold temperatures experienced in winter. When packing, make sure to add layers to your suitcase. You never know when it will be sunny and warm or windy and chilly. A nice selection of layers will get you ready for the November weather. November is one of the best times to visit Tokyo, but it isn’t actually a high tourist season. Most people visit from June through September and from April to May. November has great weather conditions, beautiful autumn colors, and fewer tourists than other times of the year. Expect manageable crowds and relative ease traveling around the city. During the fall, Tokyo comes alive with bright colors and beautiful natural scenery. Many of the city’s outdoor attractions are best experienced during this time of year. Gardens, parks, temples, and many streets are transformed into works of art. 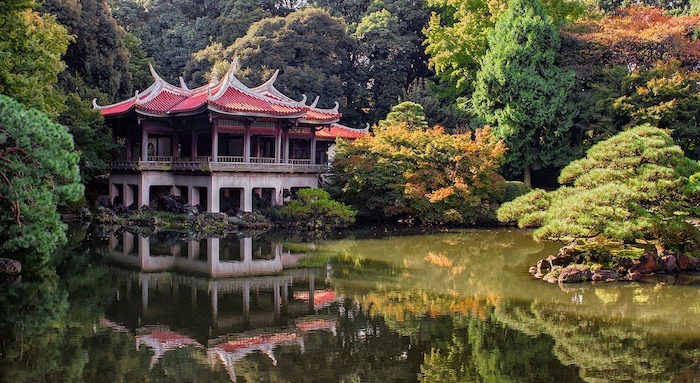 Icho Namiki Avenue and Shinjuku Gyoen are well-known Tokyo spots that look great in the fall. An Onsen is a natural hot spring used for bathing and relaxing in Japan. The country has around 3,000 scattered around, some of which are in Tokyo. The style of Tokyo’s Onsens vary, as some are in posh spas while others are similar to public bathhouses. No matter your style and budget you’ll be able to find an Onsen to enjoy. Explore options like Niwa no Yu, Spa LaQua, Fuku no Yu, or Saya no Yudokoro. The water is perfect for keeping warm in the chilly fall air. Sumo tournaments take place only six times a year and one of the those times is in November. The Kyushu Basho is the last tournament of the season, and has been said to be the most exciting. Locals get really excited about the event, especially afterwards, when the sumo wrestlers make appearances at nearby restaurants and bars. Guests can get floor seat tickets where they sit on tatami mats, which is usually the most entertaining way to see a match. If you’re visiting during November, this is an absolute highlight. If you want to witness the beautiful fall colors, this is the mountain to visit. It’s located on the outskirts of Tokyo, about an hour’s journey from Shinjuku. The trip is worth it for the scenery but also for the other attractions like monkey park and Yakuoin Temple. The hike itself takes around 90 minutes, but there is a cable car available for those who prefer to cut out half the hike. If you love the outdoors, this is a great day trip from Tokyo. This natural area is famous around Tokyo during all the seasons. It has lush gardens in the spring, and stunning fall colors in Autumn. It’s known for Ginko Avenue, where the foliage really shines. This street is usually packed with people trying to photograph the fallen leaves so try to get there earlier if you want a more exclusive experience. If you want to truly beat the tourist traps, Yanesen is the place to go. It consists of multiple neighborhoods that exude an old-world, Tokyo vibe. There are historic temples, shrines, vintage arcades, and a sense of real, Tokyo life. It’s not a trendy place, but this is what makes it so charming. If you want to see what it’s really like to live in Tokyo, spend some time here. This park is famous for its Sakura blossoms but also its autumn colors. There’s a lake in the middle of it where visitors can rent rowboats or swan boats for the afternoon. While it looks like a great place for a date, this park is surrounded by folklore saying it’s cursed by a jealous goddess. Apparently, anyone who goes on a date here is destined to break up. Disney fans and theme park-lovers need to visit Tokyo Disney. It’s a magical place for both kids and adults (but especially the little ones.) You won’t mind waiting in line for the rides in the pleasant November weather. And since it’s not the high tourist season, you probably won’t encounter awful crowds either. Explore the different themed areas of the park and look out for your favorite Disney movie characters. Located in Tokyo’s historic center Asakusa, is the city’s oldest temple. It’s gate and adjacent streets are iconic, exuding Japanese tradition. Grab some traditional street snacks or spend some time at the restaurants surrounding the area. Expect to find all of the authentic cuisine you’d want to eat while in Japan like sushi, Tempura, and Sukiyaki. Dig into the culture even further by taking a rickshaw ride, wearing a kimono, or trying sake. In the fall, the temple becomes even more picturesque as it’s framed by the changing trees. November weather is great for enjoying Tokyo’s parks. Ueno is one of the city’s biggest, and is full of entertainment that everyone will love. There’s an onsite zoo, historical monuments, and plenty of nature to enjoy. One of the main attractions here is Ameyoko street, which is a gloriously hectic road filled with street food stalls, grocery stores, and discount shopping. You’ll get a bit of everything here. It’s a must-see during all times of year, but in autumn, the view from this tower will be incredibly colorful. This is one of the best ways to see the city and its surrounding natural scenery all at once. It’s a symbol of the city and should be viewed both from below and inside the observatory deck. Why eat Ramen? Well, because it’s delicious and is one of Japan’s famous dishes. When visiting in November, a bowl of steaming hot noodle soup is definitely in order. Shinjuku is a great area to hunt for Ramen restaurants, as there are more than 300 of them there. In fact, this region of Tokyo is often referred to as the most competitive Ramen area in the city. Expect to find lots of variety in this haven for Ramen lovers. You can see more about the food culture in Japan here. This fish market is a staple in the Tokyo tourist scene. It’s been a top attraction for decades and is best seen bright and early. Visitors will line up around 5am for the chance to see the fish market in full force. The tuna auction is the main attraction, allowing visitors to watch the controlled chaos that occurs each morning. Since November means less tourists and better weather, this might be a great time to get in line and experience this famous display. For a cozy and local drinking experience try visiting Izakaya Alley. These dark and comfy bars are the go-to spots for locals to grab a beer after work. They’re pretty old-fashioned, smoky, and often so small that there are only a few seats. But, these establishments bring visitors away from the tourist centers and serve up traditional, Japanese bar snacks. It’s a great way to end a crisp November day of sightseeing. Tokyo takes cafe culture pretty seriously, resulting in some incredible cafe experiences. Whether you want a coffee or a Matcha latte, you’ll be able to find one in a unique setting. Some of these cafes are over the top like the Kawaii Monster Cafe, which has wildly colorful food and decor. Stop by the Steamer Coffee Company for beautiful latte art, or the Suzu Cafe for its pastel and neon interior design. Try Mojo Coffee for a New Zealand-style Flat White, or 76Cafe which is part hair salon, part trendy coffee shop. A warm cup of coffee or tea will feel great in the crisp November air. Tokyo is an epicenter of technology, so it’s no surprise that they have theme parks dedicated entirely to virtual reality. While November is best spent outdoors, there may be quite a few rainy days to deal with. A VR theme park is the perfect way to spend a day indoors while being endlessly entertained. It’s quite a novelty and is a highly recommended experience for anyone who is a bit of a tech nerd. Tokyo is famous for a lot of things, and wild themed restaurants is one of them. It’s all part of the experience, and you’ll have quite a few options to choose from. Visit the Alice in Wonderland Restaurant where costumed servers bring you magical food and drinks. There’s the maid cafe where servers dress as maids and treat you like royalty. And, don’t forget about the robot restaurant which is sci-fi-themed and features giant robots and lots of neon. Visit the Zauo Fishing restaurant where you can fish for your dinner right in the dining room. There’s a prison-themed cafe where guests often get chased by monsters, and a ninja-themed bar where servers can do impressive tricks. Try out the creepy asylum-themed bar, aquarium bar, train-themed restaurant, vampire cafe, sumo-themed restaurant, ghost-themed bar, and more. This traditional festival is a rite of passage for young, Japanese children. It’s held each year on November 15th and celebrates the growth and well-being of the children. The boys and girls dress in kimonos and visit shrines around Tokyo. It’s likely that you’ll catch a glimpse of them if you spend some time outside that day. The children are given traditional candy that represents life and longevity, and families usually arrange some kind of photoshoot to capture this special day. This festival is a big player in the Asian film scene. It runs from October 25th until November 3rd so you can catch the end of it if you’re arriving early in the month. The festival features films from all over the globe and the lineup is typically star-studded. While tickets are limited, many showings are open to the public. You’ll have a chance to see some of the best up-and-coming talent before your friends back home do. Taking place in early November this massive festival is great for art and music lovers. It features nearly 10,000 booths of craftsmen, artists, designers, musicians, and performance artists. It’s a great way to enjoy the weather while experiencing the best of Tokyo’s modern art and culture scene. This festival occurs in the beginning of November and is three days of Japanese culture, performances, and demonstrations. Some of the country’s best performers and artists will be presenting, including horseback archers and sumo wrestlers. Not only is it fun, but it’s a great way to interact with the locals. This festival happens across the country, including Tokyo. It’s also referred to as ‘days of the rooster,’ and is characterized by the selling and buying of rakes. These rakes are decorated with lucky symbols and are sold at the Tori No Ichi markets. You’ll most likely witness lots of haggling from locals and a clapping ritual that’s performed each time one is sold. Running from mid-November to January, this festival takes place all over Japan. They are usually intertwined with shopping venues and department stores who are competing for most innovative show of lights. Tokyo is one of the most impressive cities when it comes to light displays. Planning a trip to Tokyo? November would be a fantastic month to do it. The weather is great and the crowds are minimal. Whether you’re spending time outdoors or cafe hopping, everything is better in the crisp November air. Make sure to book on to one of our cooking classes to spend some time learning how to make delicious warming authentic Japanese cuisine.